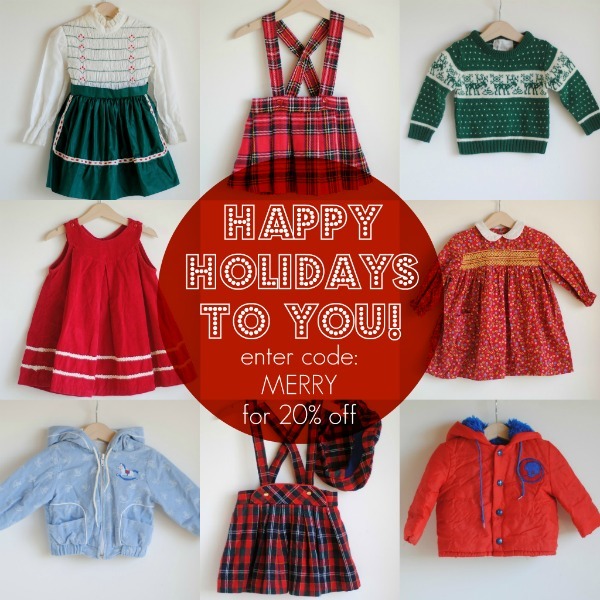 hart + sew | Vintage Baby Clothing: shop update: Holiday Sale! Thank you for all of the comments and emails earlier this week, we are back from our quick trip. The funeral was nice and it was wonderful to see so much family. We even got to put together an 'Express Christmas' one night which was a lot of fun (Modern Family anyone? Best episode ever). I'll share more later, but for now I wanted to let you know I'm having a sale in the shop - enter the code MERRY at check out for 20% off your order. Christmas is coming up fast! Eep! i am wishing that reindeer sweater was size 3-6 months so baddd. I love that dress! Great pictures, nice silhouette!